The Electronic Filing History Report enables you to produce reports indicating slip types that have been submitted to CRA or RQ electronically and submission dates. Refer to the section Layout Options for details on configuring the layout of the report. Select the return(s) to include in the report. Use "Select All" to select all returns or "Clear All" to deselect all returns. 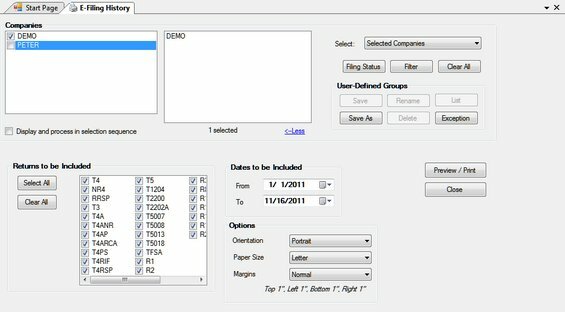 Select the date range to be included in the report.